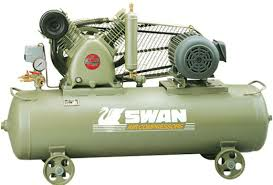 SWAN air compressor S series with horsepower above 15 HP are equipped with special enforced lubricating system,which are capable of running 24 hours continuously with start/stop frequently,and under tough working environment. compressors whose duty cycle over 50%. To stop and start the compressor by a pre-set pressure switch . service life and reduce power consumption.